Wow! 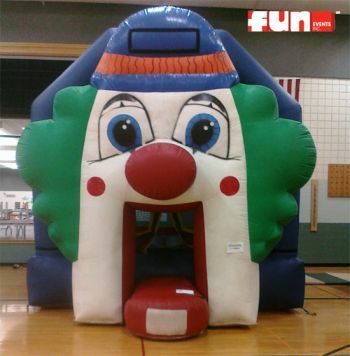 It's a giant inflatable clown face bounce house! Kids crawl into the large clown's mouth to jump in the amazing spacewalk / moonwalk style jumping arena. Specifies if this rental game / attraction is available to be picked up at our Oak Creek, Milwaukee Wisconsin area party rental supply store. Our recommended age ranges are established to ensure safety for participants. We also advise minimum ages for participation to be able to perform all of the required challenges related to the specific rental item. Please ask us for more details regarding any specific rental item. Your guests' safety is important to us. We advise that you never exceed the maximum participants capacity when using any of our rentals. Proper supervision of all participants is also advised. We do not recommend allowing participants of unequal size to compete or participate at the same time in most of our attractions. Please ask us for more information regarding specific rentals. For proper safety, to prevent injury, and to ensure this rental functions like it should, we advise not exceeding the recommended weight capacity. Most of our attractions operate best when given their own individual standard 120 V 20 Amp electrical circuits. We do include extension cords with any rentals we deliver that require power. Please contact us for specific questions.